Reports from the Central Bank of the Bahamas indicate that Tether Ltd. may have never deposited funds into the country. 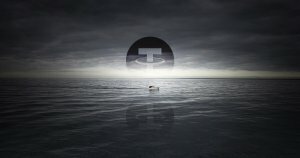 These findings could suggest that Tether may be holding their reserves elsewhere, or not have any reserves at all. In either case, the results could be catastrophic for the cryptocurrency markets. Investors have become increasingly concerned about Tether’s stability. Tether underpins billions of dollars of value in the cryptocurrency markets through its widely used USDT, a cryptocurrency that is allegedly backed one-to-one by U.S. dollars. Yet, despite the importance of Tether in the cryptocurrency markets, the company has failed to undergo audits or clearly disclose its banking relationships. The refusal to conduct these actions go against the company’s previous claims. Furthermore, based on CryptoSlate’s investigation below, there is little evidence to suggest that Tether has the U.S. dollar reserves it claims in its bank in the Bahamas. Credit to Zerononcense Blog for conducting much of the core analysis on Dec. 21st. These concerns have culminated in a U.S. Department of Justice launching a criminal probe earlier this year. Allegedly, the DOJ is focused on potential Bitcoin price manipulation due to Tether and its related exchange, Bitfinex. Tether and its USDT underpin a large segment of the cryptocurrency markets. Currently, there is $1.9 billion USDT in circulation. In one estimate, at least 30 percent of all Bitcoin transactions that take place on exchanges use USDT. Yet, as shown below, based on statements from the Bahamian Central Bank there is no evidence to suggest that the Bahamian banking system received any large cash or cash equivalent deposits, in either foreign deposits, native Bahamian dollars, or in foreign currency deposits held on behalf of another bank outside of the Bahamas (nostro accounts)—from Tether Ltd., or any other corporate entity. These findings run contrary to statements from Tether Ltd., Deltec Bank & Trust Ltd., and reports from Bloomberg. In an attempt to clear the rumors around Tether’s dollar reserves, the company released a statement from its banking partner Deltec. That said, there are some questions about the letter’s authenticity. Notably, the letter’s signature does not indicate which employee from Deltec signed the document, nor does the letter carry the printed name of anyone from Deltec. According to reports from Bloomberg, the bank has not confirmed or denied its relationship with Tether Ltd. In the past, Tether has had to sever its relationship with other banking partners. Most companies do not want to offer services to cryptocurrency companies because of risks around know-your-customer (KYC) and anti-money laundering (AML) laws. It’s unclear whether banks severed ties with Tether because of its cryptocurrency-based business, or because of the company’s other practices. Both banks and Tether Ltd. are reluctant to disclose their relationship, as this has resulted in banks losing partnerships. For example, in 2017, Wells Fargo terminated its relationship with correspondent banks in Taiwan because of the Taiwanese banks’ dealings with Tether. Although banks are typically risk-averse, especially when dealing with cryptocurrency companies, it appears that Tether and Bitfinex have had an unusually difficult time securing a reliable banking partner. Some Tether critics have made this a point of suspicion. Tether and Bitfinex then arranged for Puerto Rico’s Noble Bank to help connect them to customers and also used Crypto Capital Corp. as a payment processor. Tether’s relationship with Noble ended in October when the bank became unprofitable, as reported by Bloomberg. Tether then established a relationship with Deltec Bank in the Bahamas to fulfill its custody needs. If these reports are accurate, confirming Tether’s reserves would be a matter of tracing the transfer of $1.7 billion into Bahama-based Deltec. These figures are roughly in line with the Deltec statement confirming deposits of $1.8 billion. If these statements are true, then there should be evidence of this transfer between July and November of 2018. Fortunately, figures from the Central Bank of the Bahamas could shed some light on the transfer. Based on the above information, these reports should also include any transfers into and out of all banks in the Bahamas. According to a different October report from the Central Bank, the island has roughly 170 licensed banks, including Deltec Bank & Trust Ltd.
One telling feature of the Central Bank’s report is a summary of the island’s M2 assets. M2 assets, according to Investopedia, include saving deposits, money market securities, and mutual funds, in addition to M1 assets (cash). It is important to include an analysis of M2 funds because Tether likely earns its income from lower risk securities, such as those included in the M2 money supply. One feature to note about these reports are that they are quoted in Bahamian Dollars (BSD / B$), which is conveniently pegged one-to-one with the U.S. dollar. All foreign deposits and instruments in these reports are converted into their respective amounts in BSD. An advantage of the Bahamas is that the island’s banking system is small enough to gain meaningful insight into Tether by scrutinizing these reports. As stated in the Central Bank’s November report, there are roughly $6.8 billion in M2 deposits held in all Bahamian banks. Tether’s deposit should have arrived between Jul. 31st, when reports from Bloomberg suggested the account was drained, and Nov. 1st, when Deltec claimed to have an account with Tether with a balance of roughly $1.8 billion. Where these reports show concern is cross-referencing M2 money supply from July, August, September, October, and November. For the months of July through November, M2 deposits fluctuate between $6.7 and $6.8 billion. However, according to statements from Tether Ltd. on both Twitter and the company’s website, the island’s reserves should have increased by $1.7 to $1.8 billion coinciding with the alleged July transfer and the November statement from Deltec. Perhaps other metrics could explain Tether’s deposit into the Bahamas. External liquid assets include cash and cash equivalents, such as bonds and money markets, denominated in foreign currencies. Since July, this value has consistently fluctuated between $1.7 and $1.9 billion. External reserves are reserves of foreign currency stored in nostro accounts. The Central Bank reports that excess reserves are roughly $1.3 billion, down from $1.5 billion since July. These figures indicate that it is unlikely that Tether deposited funds into an account in the Bahamas and then later transferred those deposits into a nostro account overseas during the five months between Jul. 1st and Nov. 30th. Since July, these figures do not suggest that there was a large deposit of foreign currency—including USD—into the country. Then, perhaps, Tether converted its USD to BSD prior to transferring it into the country. In the last three years, external reserves during November were $0.9 billion in 2016, $1.4 billion in 2017, and $1.3 billion in 2018. Presumably, total money in circulation has not changed substantially since September. If that is the case, then at most half of the M1 money supply is allowable in external reserves (foreign deposits). Half of the M1 money supply would roughly equate to $1.35 billion. With external reserves already sitting at $1.3 billion, that only leaves $50 million available for additional deposits. Based on these figures, it is unlikely that the Bahamian banking system accepted a deposit of $1.7 billion in foreign U.S. dollars, nor is there an indication that a large amount of BSD was deposited. That said, perhaps Tether is still in the process of converting its USD to BSD. As mentioned in the prior section, it’s possible that Tether is exchanging its USD for BSD to deposit into the Bahamian banking system. If that was the case, the reports should show at least a hundred million or more increase in net sales to banks or to other non-bank institutions in YTD section 4.1.a or 4.1.b. For year-to-date (YTD) figures, the Central Bank’s net sales during the year amounted to $663 million, with $751 million of that sold to non-bank entities, netted against $88 million purchased from banks. One could argue that when compared to 2017, the island experienced a large net influx of foreign currencies from purchases. Tether could have made BSD purchases over the year, and the data can be construed to potentially support that idea. Related: Is Tether Quietly Exiting the Market? Since July, net sales to other non-bank institutions gradually went from net purchases of $6 million in July to net sales of $312 in November, a change of $318 million in net currency sales. If Tether made BSD purchases over the course of the year, which is again unlikely given the timeframe, it is possible that Tether is gradually converting its USD to BSD. That said, there is no evidence that those BSD are getting deposited elsewhere in the Bahamian banking system. However, assuming that Deltec is classified as a ‘commercial bank’ when dealing with the Bahamian Central Bank, then the currency conversion would instead be reflected in net sales to banks in 4.1.a, which fluctuates between sales of $40 million and purchases of $18 million, not nearly enough to accommodate a $1.8 billion conversion of USD. Another figure to examine is total dollar deposits residing on the Bahamas. From July to November, these figures remain at a stable $6.5 billion, demonstrating that no new cash deposits, BSD or otherwise, stayed within the Bahamian banking system from the start of a month to end of month. It’s possible (but unlikely) that Tether deposited funds briefly , and then those funds left the country before end-of-month reporting. However, there is no evidence to suggest that. In a final glance over changes in figures in all reported categories between July and November, there is no substantial month-to-month change that would suggest that there was large deposit entering the Bahamian banking system. On Dec. 25th, Twitter user Spoofy McSpoofface provided evidence that could suggest Tether deposited funds briefly in July and then withdrew those funds the following month. From June to July, the Central Banking System received an influx of $1.6 billion in foreign currency, and then over August and September foreign currency reserves decreased by roughly $1.6 billion. These movements could suggest that Tether deposited funds in the Bahamas, and then withdrew those funds by September. If that is the case, then the letter from Deltec Bank once again comes under scrutiny. Where these funds are currently held is unknown. If the above analysis is sound and exhaustive, then the whereabouts of Tether’s deposits with Deltec are left unknown. 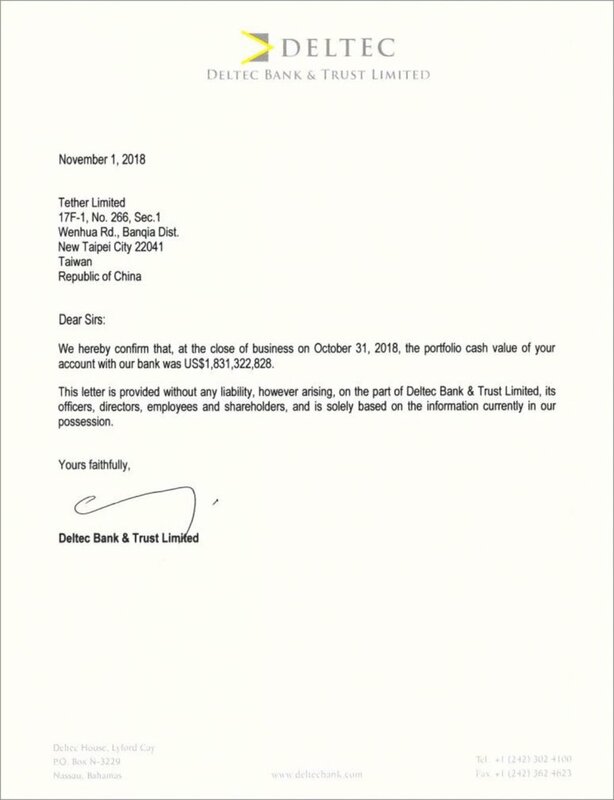 And, so long as Deltec is unwilling to confirm its relationship with Tether, it will be impossible to verify that Tether has a relationship with the bank at all. If these funds aren’t currently held in the Bahamas, that begs the question as to where Tether’s deposits are being held. Tether’s secrecy and unwillingness to undergo auditing is troubling. The large number of USDT outstanding have a multi-billion dollar impact on the market’s total capitalization. Furthermore, Tether’s close relationship with Bitfinex could mean that if one failed, the other would likely buckle. A glimpse as to what could happen in that scenario is comparable to Mt. Gox’s insolvency in 2013. At the time, the exchange handled 70 percent of Bitcoin trades and was integral to the health of the cryptocurrency markets. When the company collapsed, it ushered in a more than 70 percent crash in the price of Bitcoin in the following months. Could USDT be the catalyst to the next catastrophe? Dec. 25th, 03:00 UTC: Added potential evidence of foreign currency deposit. The post New Evidence Suggests Tether Does Not Have the Dollar Reserves It Claims appeared first on CryptoSlate.